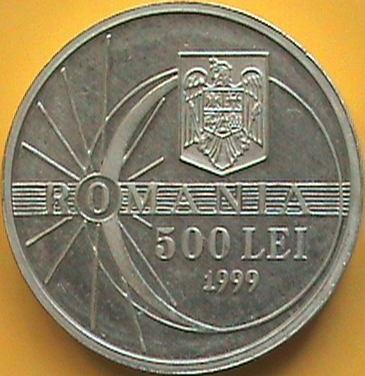 The first pattern pictures above are present on Romanian coins through the kind permission of Mr. J. Ardelean. 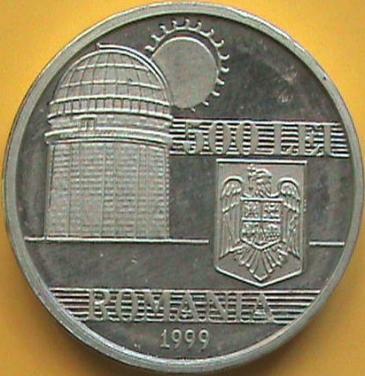 The second pattern pictures above are present on Romanian coins through the kind permission of Mr. COSARU. Astronomical Institute of the Romanian Academy is placed in Carol Park in Bucharest. It was established in 1908, as Meteorological and Astronomical Observatory. The Astronomical Observatory "Admiral Vasile Urseanu" of the Municipality of Bucharest is placed on Lascăr Catargiu Boulevard, and is functioning as a museum. In paper "Proiecte de monede şi medalii emise de Banca Naţională a României în anii 1997 - 1999" published in volume "Cercetări numismatice VIII" (2002) Mr Ştefan Ursachi, the coin's designer, states that he had eleven face patterns made. On this page faces no. 4 and no. 1 are presented (no. 1 was used for the official issue also). The circulation 500 lei 1999 eclipse coin is placed here.